Well, rested and a head full of ideas, you are ready to take on another year of X-Plane madness and an exciting one at that with X-Plane11 now becoming uber reality… well once all the bugs are finally worked out. But just days into 2017 and most of your enthusiasm has already been burnt and your are rolling your eyes around your head in pain and despair and by the end of the month you can’t believe how hard a month could have been and all that new energy is now already long exhausted. ... so welcome to 2017. I hit the boards and came back to the computer days early with the release of beti-x’s sublime Bella Coola scenery in Canada. It was just to good a scenery to not tell you about it, my feeling is that the best scenery of the year gong has already gone and in the very start of 2017 at that right now and not at the end of it, it is so brilliantly good and at that price a real bargain as well. But my best intentions was that I wanted to start out with X-Plane11 with a totally new and clear slate. 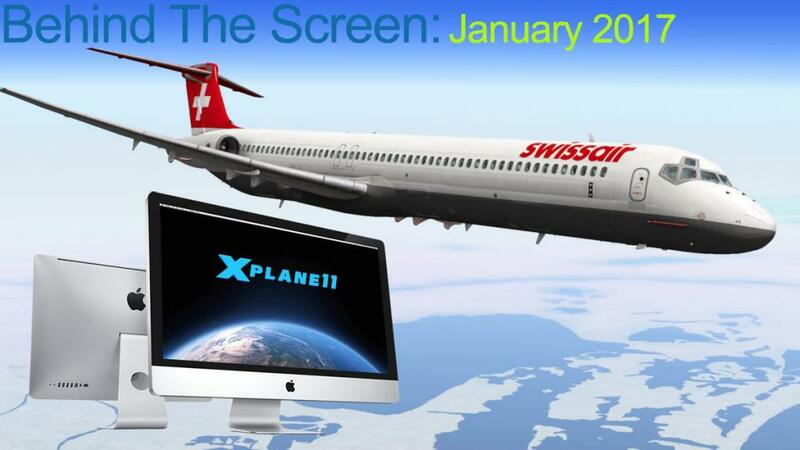 With X-Plane10 it had to a point became very unwieldy and totally messy system and that was not without trying to keep some sort of organisation about the whole package. But just too much over the years had been just thrown into the “Custom Scenery” folder and there was plugins galore and a read of my log.txt then you would have banished me to a place just south of the North Pole for complete years of isolation on being able to do any messing up of anything ever again. So X-Plane11 was to become a clean sheet, a new start and a lighter log.txt of beautiful efficiency and professionalism… well that is the general idea and to a point I have already kept to that mantra and to the time of refining my main X-Plane organisation layouts (meaning folders) to the best and clearest definition of a purest of systematic structures… in other words “keeping it all very simple”. X-Plane11 in the folders already looks lovely and organised but how long will it all last, for not for very long is my guess but I will try harder this time as the need for my own efficiency and the loss of time tracing bugs. The updates came quickly and already three weeks in and we at beta 8, and it is all looking quite remarkable. I waited patiently until the New Year before starting to configure and use the new application because there was no point in doing that earlier, and that was a wise thing to do. You do want to look around your new home and settle in but reviews are required and X-Plane10 was the work horse still to get the correct results, but once the later beta’s kicked in I was drawn ever closer to the newer sexier way of flying. I noted at the end of 2016 that 2017 was going to a really different look and change for X-Plane, and yes certainly the new X-Plane11 application delivers that look and you feel that in spades but it was a fate situation that at the same time that X-Plane11 came newborn into our world another seismic shift happened as well with the release of a new environmental engine in xEnviro. Let me be clear in that I have never been a great fan of addon environmental aids. I like the default system to be as basic as Austin and Ben’s newborn code. And when running xEnviro for the first time I was not completely taken with it either and almost disregarded it as another maybe also ran and a big cough at that price. But something this time just made me give it a few more tries and then you get the spine tingling feeling that this was going to be something beyond really special and in our X-Plane world it would be life changing. First let us be completely evident on somethings about xEnviro. It is in a way a backward step, in that the system is 2d and not 3d (there are 3d objects in there, but not the main cloud formations). It is still buggy as it caused a lot of stress over the last month, and restrictive in ways when you create reviews with only the current local weather available. It crashed a lot early on as well with JARDesign plugins causing havoc (I updated the wrong ones or simply put the same unadjusted ones straight back in again). It crashes badly if your internet is not connected or if xEnviro goes off line (I live in Australia so update midnight time in Europe is midday working time for me), and this last one brings up the question of what if xEnviro does go off line or they simply close down, we would need a backup just in case or even a connection to the current X-Plane weather data to keep it running. You also have to set the settings panel to work for you and not against you, winds need to be adjusted and so does the cloud darkness and a lot more twiddling. But the advantages with running xEnviro and the effect it has on X-Plane and when certainly paired with X-Plane11 is simply remarkable. Personally I think Laminar Research should buy the lot and make it the standard weather engine in X-Plane and simply be done with it. And I really feel for the Mac users that can’t access it’s charms yet, I hope that situation changes soon. Once used xEnviro; it is very, very hard to go back to the basic X-Plane default clouds and weather engine even with the X-Plane11 misty soft focus look. It all feels bland and basic after the wonderful formations you have now adjusted used to, and in a bonus it turns X-Plane10 into soft focus X-Plane11 and X-Plane11 with that soft focus already in there is just another world again. Then there is the biggest salvation… framerate as the plugin is completely separate from the X-Plane engine and there is no effect on framerate, okay a little in high-density periods but nothing that crucifies and fries your GPU until it begs for mercy like the current default cloud system does. Although the so called “mist” look of X-Plane11 made us divide into two camps, it soon became very apparent it was a very realistic look, and this effect combined with X-Enviro really lifts the look and feel to a whole new level of involvement and realism and that is the aim of the game. So yes within a very short time our X-Plane view of the world has changed quite significantly, xEnviro brings real world weather to your flying and you are also expected to to up your game in matching real weather situation, either with bad crosswind runway approaches/departures, fog (fog is really good) and changing enroute weather patterns. Because the weather is this close to real you do need another feature built in to the plugin to give you weather details for departure and arrivals. You are a bit blind of the weather conditions and can be caught out as you don’t know what those conditions are until you are faced with them. But for atmospheric flying and views then January was simply overwhelming in it’s delivery. I added in with XP10 my winter textures as well and that just added in more to the ride. Winter textures are great but there is a hole in a few sceneries that need fixing. In most payware sceneries the ground ortho textures are part of the scenery, so with Winter Textures activated you get a green patch in the middle of the whiteness. I do wish more scenery developers would provide winter textures with the scenery as an option, but they don’t so you find a fix. I created a batch action in photoshop to process the hundreds of texture files, you have to convert to png from dds, to use it in photoshop, but can’t convert it back again to dds. You can with Laminar’s Xgrinder tool, but you can’t automate it to cover the hundreds of files but only with a one on one process which takes too long (even the batch auto takes 20 minutes) but the results are worth it. Putting the adjusted winter files up on the X-Plane.Org is also a no go as it contravenes the developers copyright. I started this process last year, but this year reorganised the file structure and in the way the MOD (JSGME) tool does the replacement work of the files, and fine tuned the process to create the winter style files efficiently. It works very well but it is restricted to only the ground textures and not the buildings, but it looks and works very well. Another slight with Winter Textures is that the ground textures for the default autogen is still in full spring bloom, so you get patterns of green in the background white. In time of course X-Plane will intergrate the seasons better into the simulator with X-Plane11, but the developers will still have to provide the extra winter textures to make it work. When done like with beti-x’s remarkable Bella Coola which has replacement textures it is a winter wonderland spectacular. So it works when done well. But back to X-Plane11… Like I mentioned my adoption of X-Plane11 was rather slow and you would think doing what I do that I would be the very first one in there to pull it apart. But the world today is a very different place than in my youth as with software the first out version is never completed, I rarely now buy any new Apple iPhone on release but a year behind as then it is all sorted and fine tuned and that most certainly is the case with X-Plane except with sceneries, and that is absolutely certainly the case with X-Plane11. This is highlighted even more because getting in first would be giving out the wrong information and the least everyone needs right now is well the latest buzzword in “Fake News”. But some impressions are worth noting. First X-Plane11 is good, and to the point of being very good. You are seeing a sort of professionalism now coming into the simulator. X-Plane was always early on a clubhouse enthusiastic experimental sort of occupation and the idea that anyone can come and build and then fly their own aircraft. And certainly don’t get me wrong as that is still the foundation and heart of the simulator as it’s name reflects that vision. But this aspect can also create a problem in that these clubby people don’t really like things to change and although they highly welcome new people you still have to conform to their old fashioned out of date ideas. Tradition is to be respected but mostly in any area of life or business is that if you have that out of date mentality you will wither and die. As a human race we hate change, we like things the way they are “thank you, very much”, and I am one of the worst one for that. But we live in a world of change and if not our world will die or in this case the one thing we love the most is in our own simulator. Could you really live with Flight Simulator or an X-Plane that stopped evolving now ten years ago, yes the fringes of FS are still very vibrant but the core is static and very, very old. Many users see X-Plane11 as the dumb down of the simulator. A flashy intro with wizz-bang graphics to select our aircraft and sceneries, and the real horror of taking away our detailed settings that kept us twiddlers happy and contented for hours. But use the new simulator and those early disquiets quickly disappear. In reality the old x-plane set up panel was a mess or just plain pre-millennium basic. In X-Plane11 you really now have a lot of choices and the quick drill down for more of the more detailed choices in the interface to quickly and speedily do the set up of what you want. The really annoying thing with the older version was that you mostly had to start the simulator to make the changes and then reset everything for what you actually wanted, were as the X-Plane11 version is a one stop shop, go then fly. There is no doubt a lot of time, money and research into how to make the very best interface for X-Plane has been done by Laminar Research and beyond those flashy graphics it is a solid system. My horror like most to the dumbing down of the graphics page menus was to simply want it all back. But again use it. My twiddling was usually to the negative and not to the positive in most cases, in other words my efficiency went backwards and not to the better with my constant to and throwing of the settings, and in most cases I kept a preference copy to get me back to the default point I should not of changed in the first place. But the totally overall point of both areas changed above is the sheer change in the speed of not only the loading and starting of X-Plane, but the efficiency of how it runs. As Ben Supnic notes, just to have one setting of the very inconsequential settings like traffic and trees is that they can be really be made to be more focused and aligned for ultimate processing and in other words better processing with your computer and that results in a far better framerate. Speed is the key here and not the dumbing down of the simulator. Speed to start up and select what you want and to get you flying more quickly and the efficiency of the simulator working for you and not fighting you is what X-Plane11 is all about.